On March 30, 1820, Hawaii would witness the dawn of Christianity and the most influential religious group in Hawaii. After 164 days of traveling through the United States and sailing through the Pacific Ocean in the Thaddeus, fourteen missionaries (seven mission couples) would arrive in Hawaii, landing at Kawaihae and Kailua-Kona, Big Island. The American Board of Commissioners for Foreign Missions funded these missionaries, who were Presbyterians, Congregationalists and Dutch Reformists from New England. Before their arrival, the kingdom was transforming: King Kamehameha I, the monarch who united the Hawaiian islands, died, and Liholiho (Kamehameha II) and Queen Kaahumanu co-ruled Hawaii. After reigning for six months, they ended the kapu system, leaving behind a religious void. 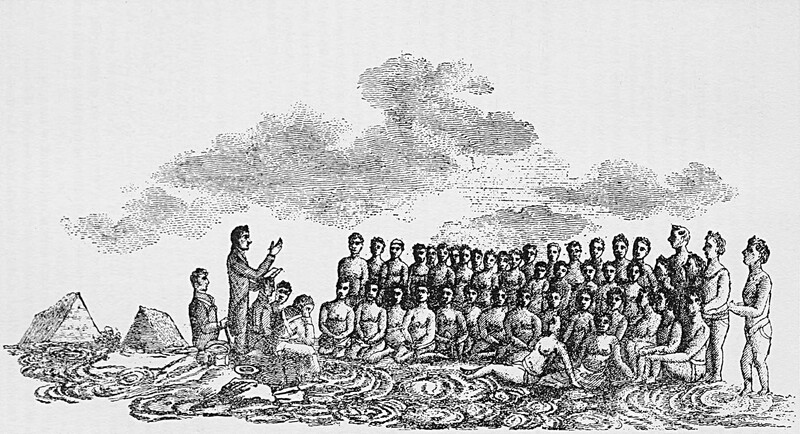 In Hawaii, the missionaries converted Hawaiian people to the Christian faith, developed the written form of Hawaiian, discouraged many Hawaiian cultural practices, introduced their Western practices, and encouraged the spread of English. One of the most powerful converts, Queen Kaahumanu, embraced Christianity, imposed it to the rest of the kingdom, and banned Hawaiian religious practices. The missionaries' impact would continue through their descendents, who would become the political, business, and cultural elites of Hawaii and act as a driving force towards Hawaii's Westernization. "Missionary Children: By S. E. Bishop Before the Cousins' Society"
"Life of Dr. L. H. Gulick: Interesting Review of an Active Missionary Worker"
"More Mormon Missions: Missionary Activity Here Is Renewed"
"Adjourned Meeting of Cousins' Society: Present, Prospective and Past Conditions make Good Showing"
"The Native Protestant Churches of Hawaii"
"Hawaiian Mission Childrens' Society Celebrates Its Golden Jubilee in Central Union"
"On the Trail of the American Missionary: Religious Romance of Transformed Hawaii"
"Roll-call of 'Cousins' Will Show 20 Who Have Passed Away"